Strapping specialist Mosca is launching a fully-automated cross-strapping solution for the print industry. The EVOLUTION SoniXs TAI-6 automatic tandem strapping machine features a new Standard-6 strap path together with a redesigned control concept and user interface to provide efficient, fast and safe operation. The machine can be specified in a wide variety of machine configurations, from low-cost entry-level models to a high-end strapping system. Incorporating Mosca’s state-of-the-art strapping technology, the EVOLUTION SoniXs TAI-6 delivers extremely precise and reliable strapping for a wide variety of products using cross strapping, transverse strapping and inline strapping in the conveyor direction. An open design ensures direct access to all core components and the machine can also be easily integrated into existing packaging lines that do not present any hazards at the inlet or outlet. The EVOLUTION SoniXs TAI-6’s CE marking means there is no requirement to install additional protection measures on site, while advanced product handling functions including hold-down device and backstop have been designed to operate without the need for further safety measures. A further user benefit is the new Human Machine Interface (HMI). This intuitive simple-to-use touch panel is language-independent, which enables the machine to be controlled via pictograms.This means the unit can be easily operated under a variety of conditions worldwide without language barriers. 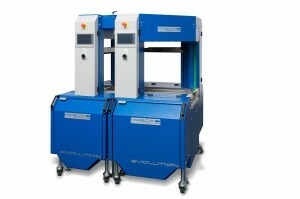 In addition, to protect work processes and the machine itself against operating errors, different operator levels can be activated depending on the user’s experience. The EVOLUTION SoniXs TAI-6’s modular design provides versatile and flexible machine configurations to meet the needs of different customer applications. As well as Mosca’s SoniXs ultrasonic welding system, customers can opt for a model with heat welding, while for product handling requirements there is a choice between electro-mechanical and pneumatic actuators. The “modular system” principle has been a key criterion throughout the engineering process for the inline strapping machine. “Standardising core components in our machines not only facilitates maintenance and cleaning but also speeds up the manufacturing process and enables us to improve our services and offer our customers a larger selection of models with a broader spectrum of applications,” explains CEO Timo Mosca.All Mosca machines are available in the UK from its wholly owned subsidiary, Mosca Direct of Cotgrave, Nottingham.